It was believed that the other genomic DNA provided by the Matthews Lab before had similar values with regards to purity/contamination (also approaching 1) Both team allergy and fence performed PCR multiple times unsuccessfully with these DNA samples. 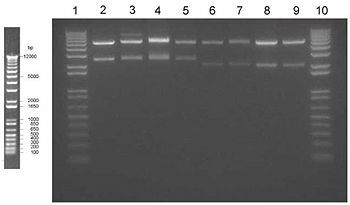 It was thought that the low purity may be inhibiting the PCR. Today we used the QIAgen DNeasy Plant Mini Kit. Liquid nitrogen was poured over the arabidopsis leaves in a mortar while they were ground with the pestle. This produced a fine green powder of arabidopsis leaves from which genomic DNA was extracted starting with step seven of the QIAgen protocol following liquid nitrogen crushing. The only change made to the protocol was that 40 μL of RNase 1 was added per reaction instead of the recommended 4 μL because the concentration of our supply was ten-fold lower. Lots of non-specific colonies - ligation failed. Placed tube in boiling water for 5 mins, then removed the water from the heat block and allowed the water, and the tube within it, to slowly cool to room temperature. 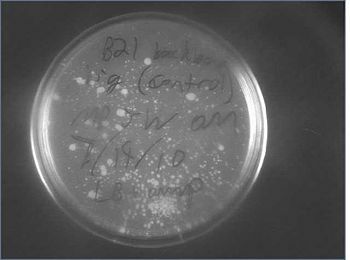 Combined .5μL 80% glycerol and .5μL overnight cell culture of the respective bacteria. Today, we did minipreps of intron and backbone. Would have also done minipreps of intron plus allergen part but none of those colonies grew. We also miniprepped Betv1.2 Sense, Betv1.1 Sense, Bet 1.2 Antisense, and Ger Sense of the plates that we grew on Monday. The rest of the allergen panel did not grow properly. 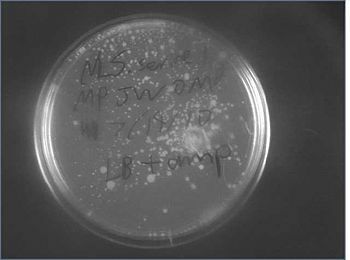 What colonies that WERE on the plate grew probably because AMP was not spread properly on the plate. We deduced this because those colonies could not grow in liquid media. We are waiting on more LB amp plates so that we can redo ligations, which is probably the reason for our lack of colonies. 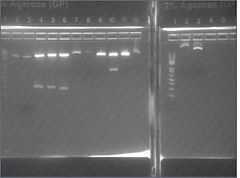 We will do diagnostic digests of all miniprepped DNA. The N & C designation corresponds to the terminus upon which the YFP was fused. This page was last edited on 26 September 2017, at 19:15.